The urban private sector declined immediately after 1949, even before the party leadership announced its decision to move toward socialism in 1953. Government agencies began to take over banks and wholesale suppliers, making it more difficult for businesses to obtain credit and financing, supplies, and customers. These changes deprived the private sector of the means to compete and grow. … Increasingly, private firms depended on state contracts for their business: the output sold by private firms on state contracts rose from 12 to 56 percent during the same period. … Without any explicit attacks on the private sector, it was gradually being squeezed by state policy and made dependent on state agencies. The gradual squeezing of the private sector turned into a frontal attack in 1952. The party launched the Three-Anti movement to combat “corruption, waste, and bureaucratism,” and the abuse of power by cadres in urban administrations. The campaign struck civil servants who had stayed in their posts and pledged loyalty to the new regime. … The campaign then pivoted to an attack on private businesses. The Three Anti campaign was merged into a Three Anti, Five Anti campaign. The new claim was that corruption among cadres was caused by the business practices of private entrepreneurs. The new Five Anti targeted “tax evasion, bribery, cheating on government contracts, theft of economic intelligence, and stealing state assets.” Work teams moved into private businesses, demanded to see their accounts, and conducted all-night interrogations that pressured business owners to confess to corruption and tax evasion, reveal the source of their “illegal profits,” and divulge hidden assets. Large fines were levied that bankrupted many businesses, which subsequently closed. Many business owners “voluntarily” turned their firms over to the government as payment for their alleged back taxes and criminal fines. And there’s lots more of interest on other aspects of the creation of the planned economy. Inspired by this reading, I dug up some historical statistics and pulled together the following chart to illustrate the progress of nationalization (the figures in this chart are slightly different from the ones Walder cites in his text, as I’m using a later statistical compilation with revised data). It’s interesting to note that pre-revolutionary China already had a significant amount of state-owned enterprises, as the Nationalists had no aversion to state ownership and made some attempts at planning industrial development (Rana Mitter’s excellent history of the civil war period Forgotten Ally discusses this theme). 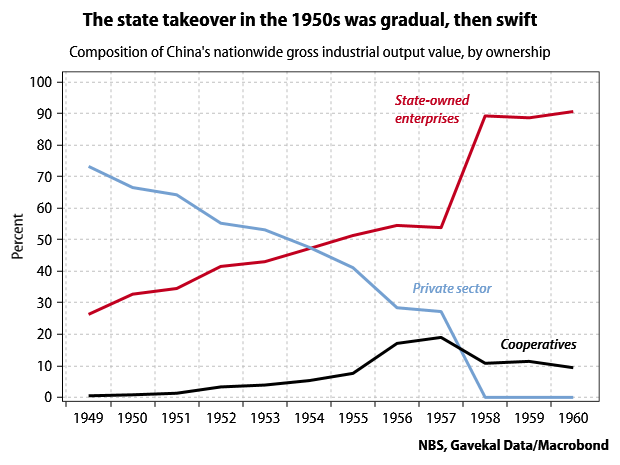 Further reading: a more detailed account of the early transition to state ownership that Walder cites is Bennis Wai-yip So, “The Policy-Making and Political Economy of the Abolition of Private Ownership in the Early 1950s: Findings from New Material,” a 2002 article in The China Quarterly (JSTOR link). ← Previous Post Is diffusion the answer to the US productivity puzzle?